In a medium bowl mix ingredient until well blended. Divide mixture into 4 and create thick round patties with a small dip in the middle (this will keep them from plumping into balls). If you are cooking these on a stove top--preheat pan over medium heat and lightly coat with cooking spray (olive oil preferred). If you are cooking on a grill--I recommend that you cook them on aluminum foil or grilling pans because ground turkey might not hold together well on the regular grill. Cook patties on each side for 4-6 minutes or until brown. Serve on whole grain hamburger buns with your favorite "fixings" and sweet potato fries. My favorite are with mixed greens, tomatoes, and avocado...try it you'll love it! If you want to cut some carbs out, use whole grain sandwich bread, use a whole wheat flour tortilla to make a wrap or make it a lettuce wrap! In my search for answers I found a great group of girls that all share one common challenge, heart disease. In that group I have made many wonderful friends with many interesting, inspiring stories. One of those friends got interviewed for the Vancouver office of the Heart and Stroke Foundation. Her story is like an unfortunate number of stories. She began to feel symptoms that are related to heart disease yet every time she went to the ER she was told she was fine. Finally, a couple of weeks after her ER trip she finally got to see a cardiologist only to find out that she had significant blockage. Luckily, my friend is still with us inspiring everyone she meets, but this is not always the case. Because the medical community does not fully understand that heart disease that afflicts women is different than the heart disease that afflicts men and that often times one or two tests isn't enough women dies of heart disease more than they die of anything else. Those who are lucky enough to survive heart disease often do not recover fully. It is important to share stories like Carolyn's to open the eyes of the people caring for us and to give us motivation to seek the treatments and tests that will get us the answers we so desperately seek! If you would like to share your story, email me and I will gladly post it in my new section of "Inspiring Stories"
Also, make sure and check out the "Heart Friendly Links" for useful information about PPCM and heart disease in general! One of the biggest challenges of giving up salt as a Mexican-American woman was giving up chorizo, and so my quest began for the perfect, homemade, heart friendly chorizo! Combine dry ingredients in a small bowl for even distribution. Using a fork, combine pork and liquid ingredients (vinegar & water) in another bowl. Pour half of the spice mix onto the pork mix and combine thoroughly, then pour the other half and combine thoroughly. I broke this step down to allow the spices to combine well with the meat mixture. Knead the mixture (either with your hands or the fork) until everything is well combined and put the mixture in zip locks. Let it cure for at least 24 hrs, although letting it cure for 48 hrs will yield a much better result. Frozen the chorizo will last up to 1 month. Refrigerated the chorizo must be consumed within 2 weeks. When thawing out frozen chorizo make sure to thaw it in the refrigerator. In a frying pan coat the bottom of the pan with olive oil and add beans with it's liquid (careful not to splash!). Sprinkle the cumin on top and let the beans heat up a bit. Once beans have been heated use a potato smasher to smash the beans. If you don't have a potato smasher you can "smash" your beans in a food processor or blender before you pour them into the pan. Stir beans to combine well with cumin and to further cook the beans. They will begin to turn a darker brown. You will know that your beans are done when their color has turned into that darker brown (thus having been re-fried!). Serve hot and enjoy! Sauteee some chorizo (check out my recipe!) in olive oil until almost fully cooked (it will shrink and change to a darker color) before you pour on the beans for a delicious dip or spicy side dish! In a medium-to-large stock pot, combine ingredients and pour water so that it goes about 2 inches above the beans. Bring to a boil, add sea salt (if using). Boil for about 5 minutes and then bring it down to a simmer for about 3 hours or until the beans are fully cooked (they will turn brown and become soft and less starchy) checking on it about every 30 minutes and adding water as needed. If you would like to intensify the flavors of the onion and garlic add a teaspoon of olive oil (or enough to cover the botton of your pot) and caramalize the onion and garlic before pouring the beans and water in. If you would like spicy beans, add one large jalapeno (seed it and remove veins for a mild flavor)when you caramelize the onions and garlic. Remember to sort and wash your beans before you use them. You want to remove beans that have been split or just don't look good as well as any debris (rocks, etc) that may have snuck into the bag. For a quicker cooking time, soak your beans overnight. It will shorten the cooking time by as much as 2 hours! And make sure that you pour the water that you soaked the beans in because it will add taste. Spray a cookie sheet with cooking spray. 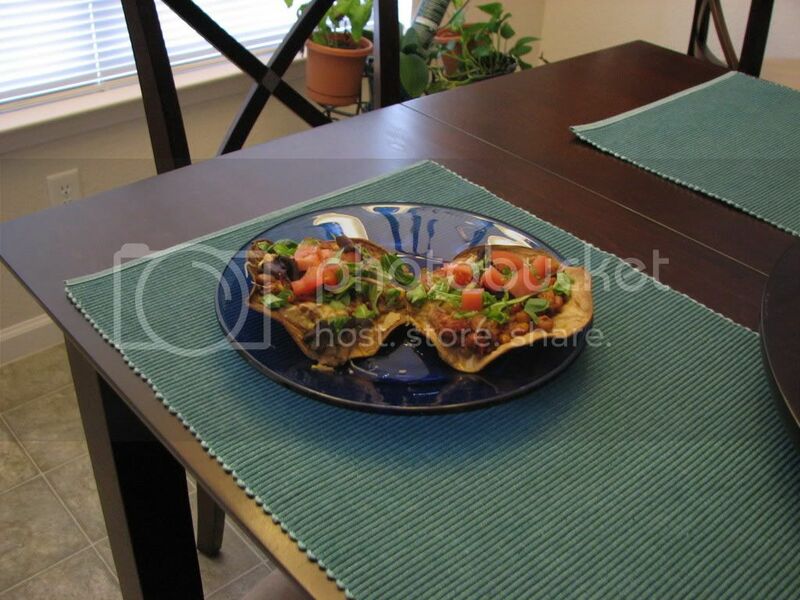 Lay tortillas on the cookie sheet and lightly spray cooking spray on top of tortillas. Place tortillas in preheated broiler for 3 minutes, flip tortillas and cook for another 2 minutes. Meanwhile heat beans and chili. Once the tortillas have been toasted, top them with the refried beans, chili and cheese (put in microwave for 30 seconds if you would like to melt the cheese), top with lettuce and tomatoes. Preheat oven to 375 degrees. Spray a 3 qt. glass baking dish with cooking spray, coat the bottom of the dish with a thin layer of chili. Heat tortillas one by one on a pan or "comal" (cast iron skillet), as they are being heated stuff with 1 tbs of chili and some cheese (just sprinkle across on top of the chili), roll up each tortilla around its stuffing and lay them in the cooking dish seam side down, and side-by-side so they do not unroll. Once you have all the enchiladas in the dish spread the remaining chili on top of the entire dish and top with the remaining cheese. Put in preheated oven until cheese has melted and has begun to brown. 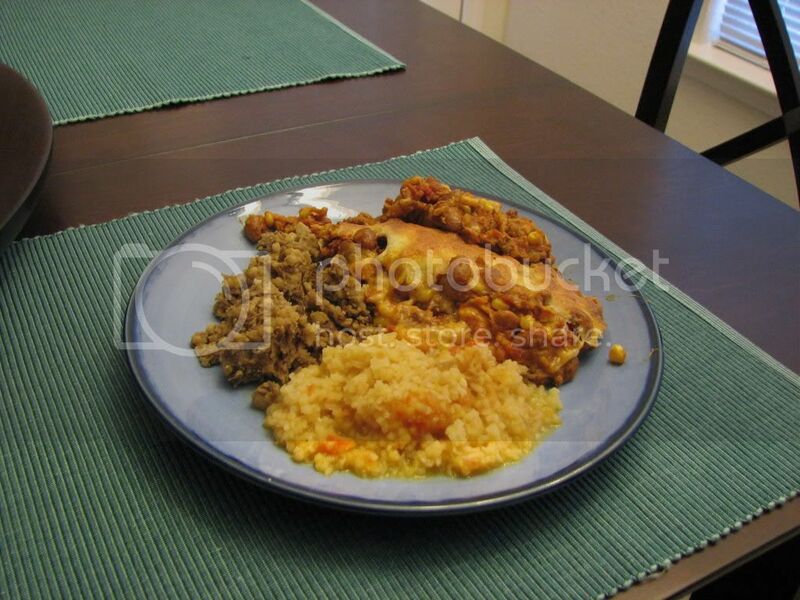 Serve with refried beans and rice. In a large stock pot, caramelize onion and garlic in a medium low heat until the onion has began to brown (it becomes a dark orange-caramel color). About half way through the onions will become transparent, at this point add the jalapenos. Add the ground turkey and begin to brown the meat, stir occasionally until the turkey meat is almost completely cooked. Turkey unlike regular ground beef will not truly brown, so how do you know when it's cooked? When the meat begins to cook it will give off liquid (as will any meat) when that liquid is clear and begins to evaporate your meat should be cooked. After about 4-5 minutes the meat should be almost completely cooked, at this point you should add all your seasonings and stir. Add tomatoes (canned & fresh), tomato sauce, and beans (with some of the liquid of the beans), and frozen corn. Stir to combine thoroughly. Add chicken broth and worcestershire sauce, stir to combine and simmer for 40 minutes. I used home baked beans to control the amount of sodium in them (check out my recipe!). My favorite brand of organic, low sodium chicken broth is from Albertson's because it only has 70 mg of sodium per cup! This recipe yields a mild-to-hot heat, so if you want more heat add more chili powder (my favorite is New Mexico Chile) or leave the veins/seeds in the jalapeno, for milder flavor decrease the amount of jalapeno and/or chili powder. Look out for recipes that will show you what to do with this chili recipe! When I was 25 my husband and I decided to try and have a baby. We got pregnant right away and my pregnancy was great! Up until the last month of my pregnancy. Two weeks before my due date I went to the hospital thinking I was going into labor only to find out my daughter was dead and I was going into heart failure. I had what is known as Peripartum (or postpartum) Cardiomyopathy. It happens in 1 or 3-4000 pregnancies and little is known about the condition. My particular case is believed to have been caused by undiagnosed preeclamsia. I left the hospital with an ejection fraction (EF) of 15-25%, a bag full of meds and a new diet. I was on a sodium restricted diet of 2000 mg a day and a liquid restricted diet of 2 liters a day. I am a self-proclaimed foodie. I love to cook food, bake food, eat food, watch food shows, read about food in three words....I LOVE FOOD! And here I found myself unable to use salt, it was a big challenge for me. However, through a lot of research and experiementation I have found that through a wider use of foods, herbs, and spices one can achieve food bliss without the use of too much (if any) salt! Through good food choices, exercise and a decreasing amount of medication I am happy to report that today (9 months after my heart failure) my heart has an EF of 65-75%, my LDL & Triglycerides are in the low 50's and I am beginning on a year-long journey to pregnancy and then hopefully parenthood! So what have I learned, I've learned life's short so don't waste it! I've learned that with determination and the appropriate research you can live a healthy life without giving up flavor. My purpose for this blog is to raise awareness of heart issues that can affect women of all ages and to share information that I find on the internet from reliable sources and recipes that I find and/or come up with to help others lead a happy & healthy life!